Chinese texts traditionally used no punctuation. A small circle (。) could be used in annotations to mark the end of sentences or phrases, and it also turned up in printed texts, to the lower right of the last character in a sentence. In this text, the “。” represents a continuation: the first character of a phrase has no punctuation, but every subsequent character is marked with a “。”. The text is maddening to read, and while some of that difficulty may be due to the mark meaning roughly the opposite of what it means today (a full stop), I suspect that it may not be a very efficient system even for an experienced reader. It’s certainly not meant for hand-written texts. New China was written by Lu Shi’e (陆士谔, 1878-1944), a Chinese herbalist, and tells the story of a man who falls asleep in 1910 and wakes up in 1951 to a fabulous new world in which China is no longer the sick man of Asia. The novella resembles Liang Qichao’s Future of New China (新中国未来记 ,1902) and other late-Qing utopian fantasies, but Lu could actually write fiction: his output ranged from martial arts romances like The Eight Swordsmen (八大剑侠) and The Flying Guillotine (血滴子) to unauthorized sequels like New Outlaws of the Marsh (新水浒) and amounted to some hundred novellas and novels. New China was recently exploited for use in promoting the Shanghai 2010 World Expo: Lu’s novel was said to have accurately predicted that Shanghai would hold an expo of “10,000 nations” (万国博览会) one hundred years from its date of publication (i.e. in 2010). The novel actually says that Shanghai hosted a domestic expo (内国博览会) in 1928. In April, Chen Zhanbiao (陈占彪), who has compiled a fascinating volume of eye-witness accounts of World Expos by late-Qing and early Republican Chinese travelers (清末民初万国博览会亲历记, 2010), wrote an excellent rebuttal of the erroneous claims in the China Reading Journal. 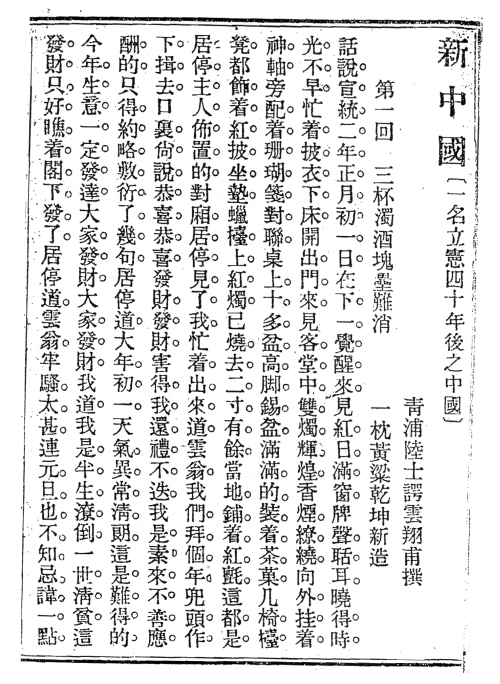 As proof, Chen’s article reproduces one of the pages from the 1910 print edition which, like the above image, uses a nearly unreadable system of punctuation.